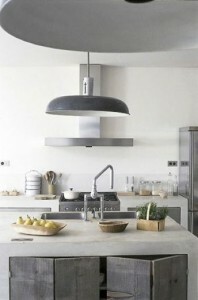 Kitchens are the hub of the home and, increasingly, an extension of our living, lounge and study areas. Kitchen designs now take on many of the aesthetic and “furnished” qualities of our living zones, while still having to be highly functional. Today I share some classic kitchen combinations that bring both style and practicality to this important family and entertainment zone. Timber tones in the kitchen are a beautiful choice when paired with white bench tops and cabinetry. 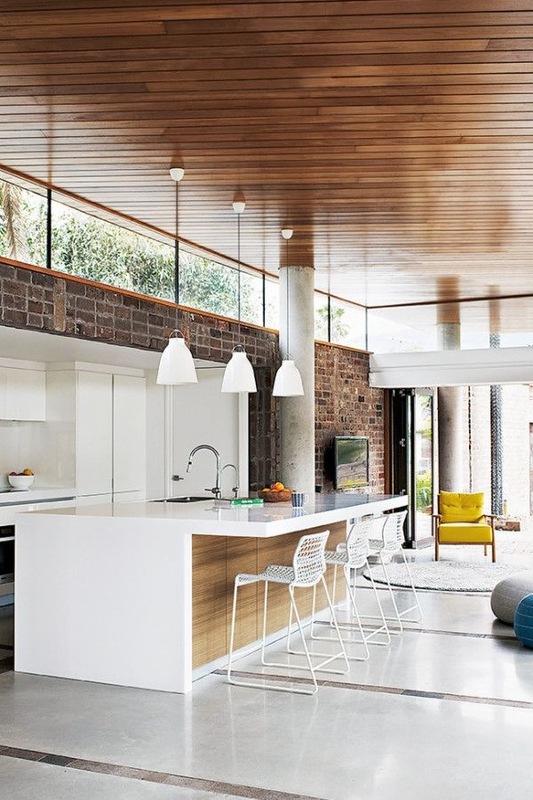 Natural timber and white suit the Australian lifestyle and our love of light, bright interiors. 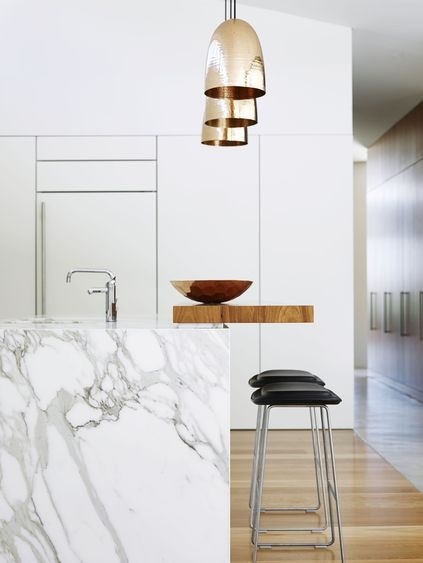 All-white kitchens can feel a little glacial, so I like to introduce timber accents to add warmth and texture. 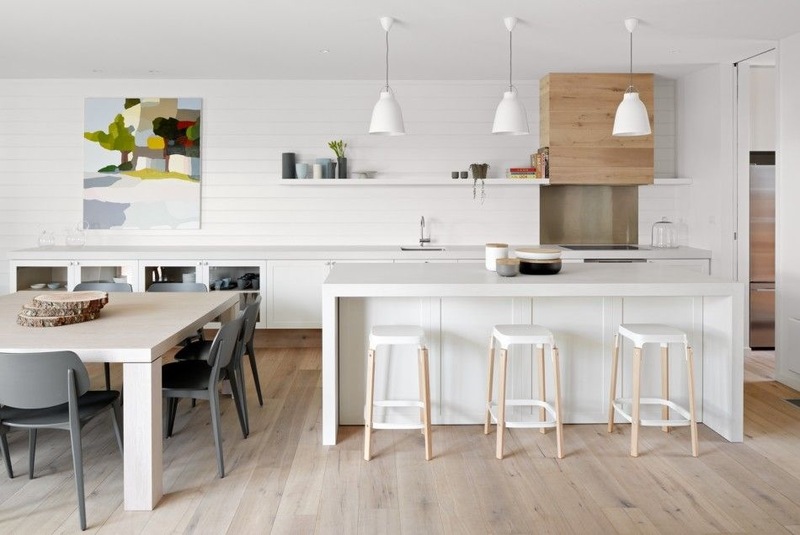 Timber bench cladding works beautifully in this all-white beach house kitchen. Located on Austinmer Beach. Photography by Prue Ruscoe. 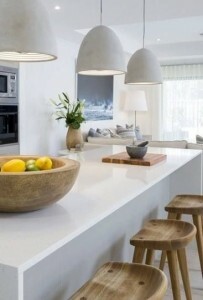 Timber stools, bowls and accessories also provide contrast to an all-white scheme. White kitchens love colour. These spaces have introduced bold accents to create interest and personality. Arent & Pyke created simple drama with black, red and green accents in their award-winning project The Avenue. 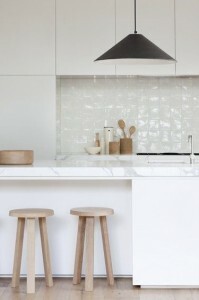 And don’t the white Hay stools look gorgeous in this scheme? 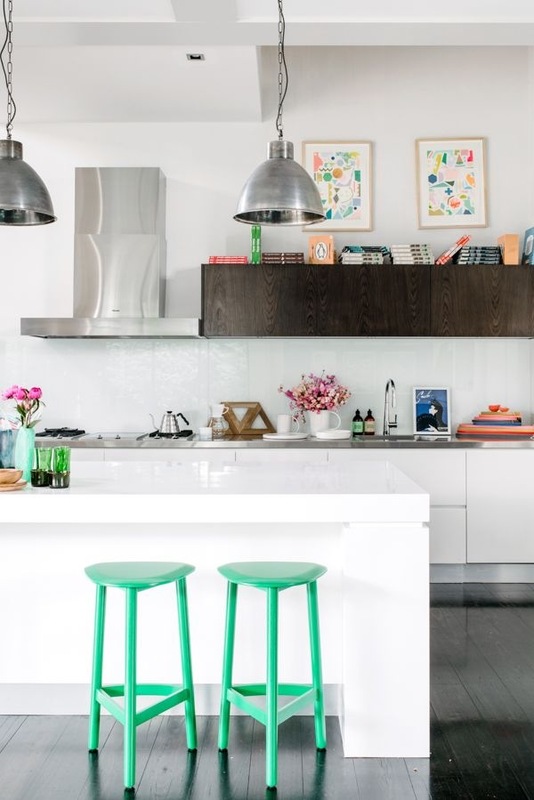 Colourful stools are another way to inject personality to a white kitchen. And you don’t have to commit to tiles or cabinetry for this one. These bright mint stools are from Jardan. For more stool ideas see my post on how to find the perfect stool. 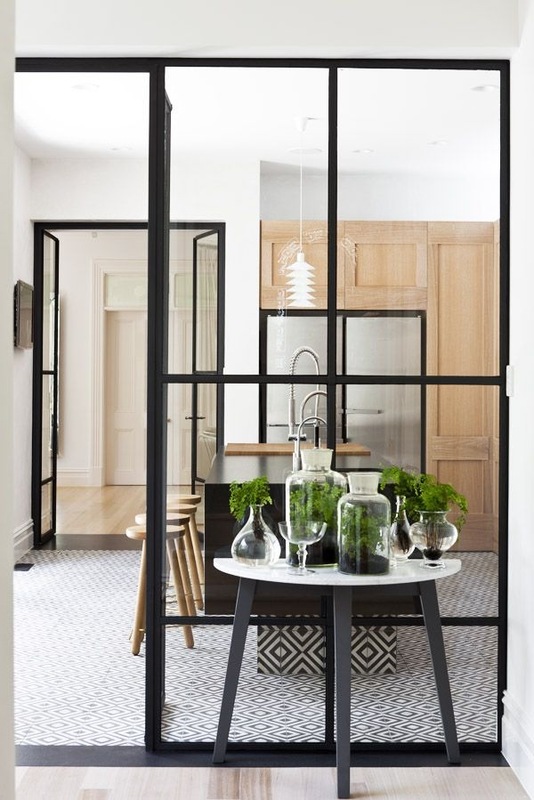 Black joinery and furnishings add drama and sophistication to a kitchen space. 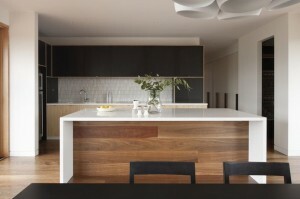 I particularly love black when combined with white and timber. 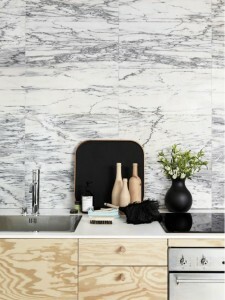 Black cabinetry also hides a multitude of sins and blends effortlessly in to walls for a seamless look. 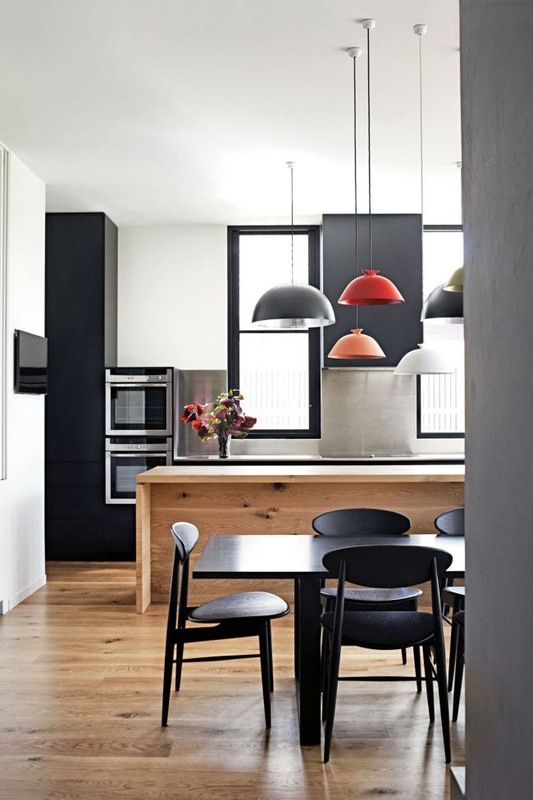 This black, stainless steel and timber palette with coloured pendants creates an inviting mood. 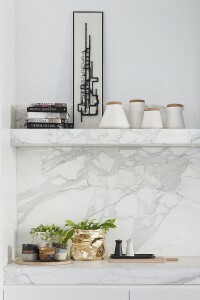 Image courtesy of Vogue Living. Black + white + timber. A timeless combination. Striking sophistication in this scheme. 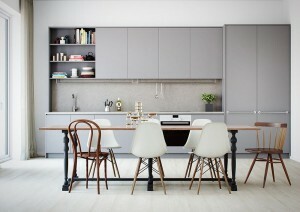 And I love how they have foregone the bench with stools concept for an integrated gathering, seating and dining table. 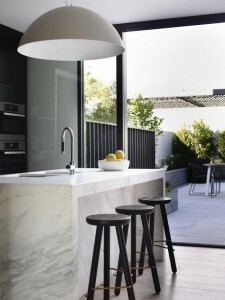 Marble is a classic kitchen all-rounder, working well with whites, blacks, metallics and timber. 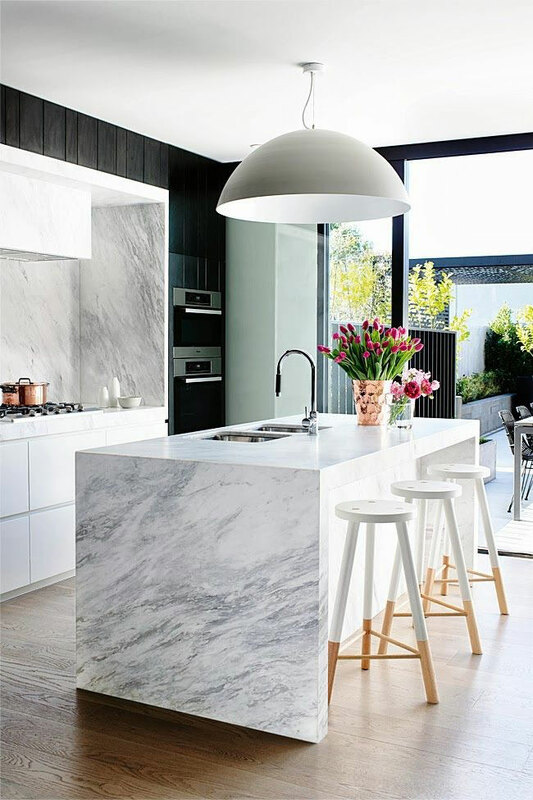 If you are up for the cost and maintenance, marble is an enduring and stylish finish for kitchen bench tops and splash backs. Reality shows have popularised concrete floors, bench tops and finishes. 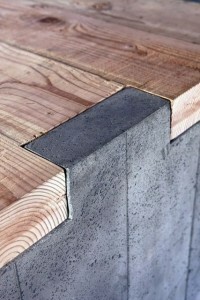 Concrete-look tiles have also come a long way. 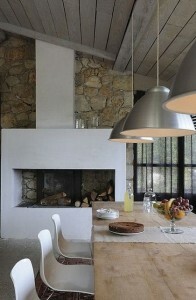 I love this look in contemporary settings, holiday homes and modern country schemes. Keep finishes raw and accessorise with plenty of texture. 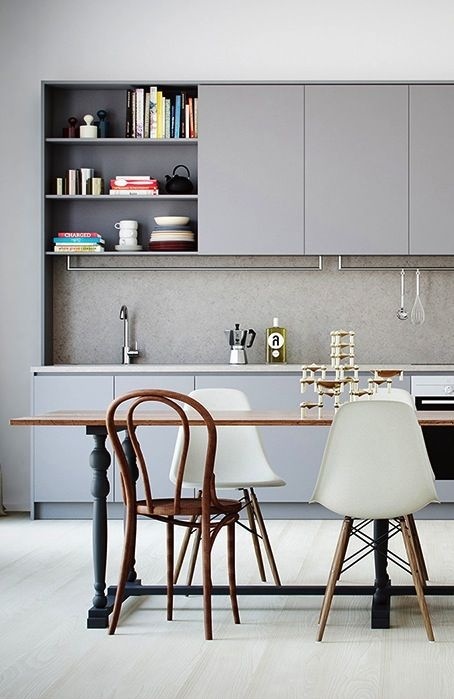 Cool grey cabinetry and timber soften the glare of white bench tops and floors. I adore this scheme for its sophisticated and restrained yet warm palette. A classic timber table reworked in modern tones meets contemporary cabinetry with ease. Feature tiles are popular in kitchens to add colour, texture and personality, although be aware of choices that may date. 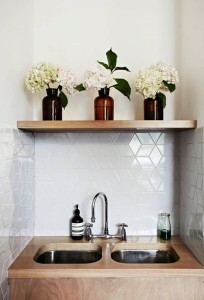 Hecker Guthrie pulls off a striking black and white geometric pattern in this tiled kitchen. 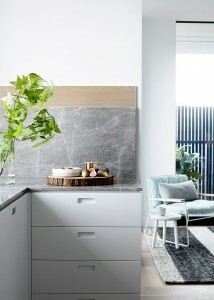 Blonde cabinetry and foliage soften the look. 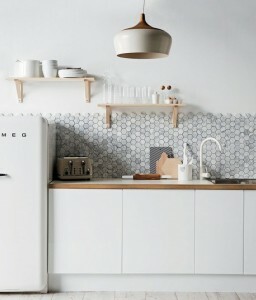 The Di Lorenzo hexagon tile below is a popular on-trend choice for kitchen splash backs and bathrooms. 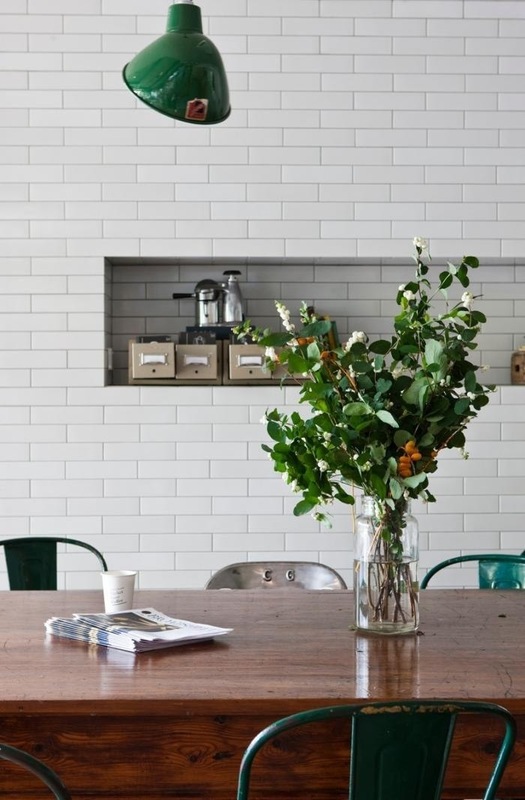 Try using feature tiles in a smaller area of your kitchen if you are not ready to commit to a whole wall. Marble, timber and plywood have inherent texture and pattern for those who are pattern-shy. I love seeing art in a kitchen. It links the kitchen to the adjacent living spaces and is another example of kitchens being “furnished” for style as well as function. 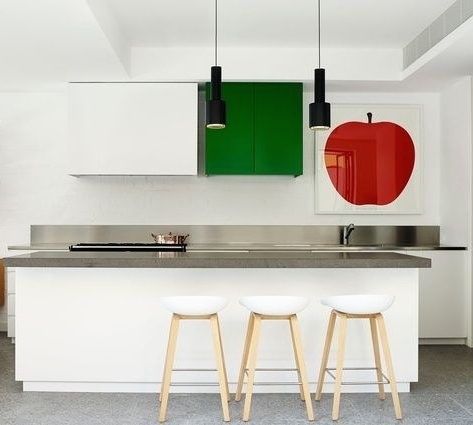 Mim Design brings it again in this understated white kitchen with timber accents and striking artwork. 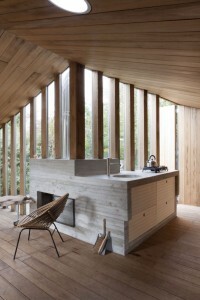 Not only do I love the art, but the multiple tones of timber used in this space. 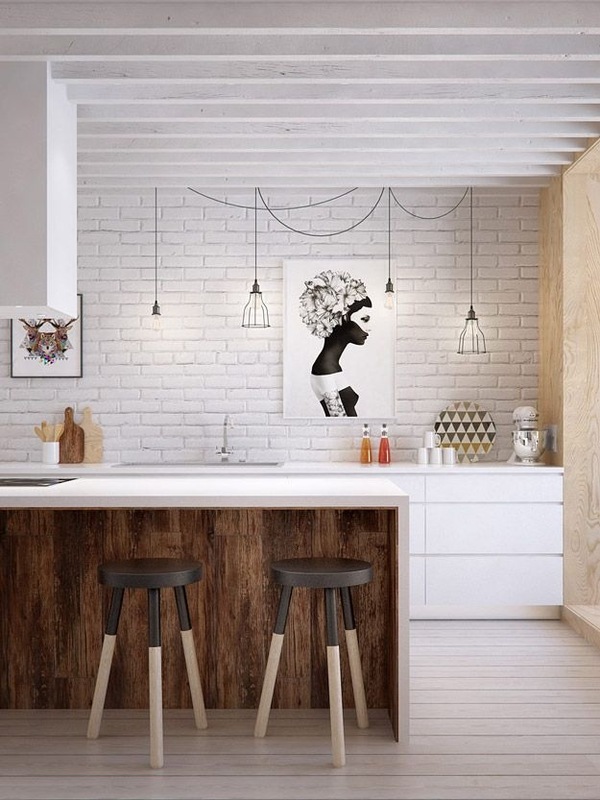 Plywood, dark and light timbers combine with white exposed brick, cabinetry and white-washed floors to create texture and depth. And last but not least, don’t forget the foliage! All kitchens deserve a dose of greenery. Green works so well against whites, timbers, blacks and marble and is the perfect finishing touch to any kitchen scheme.